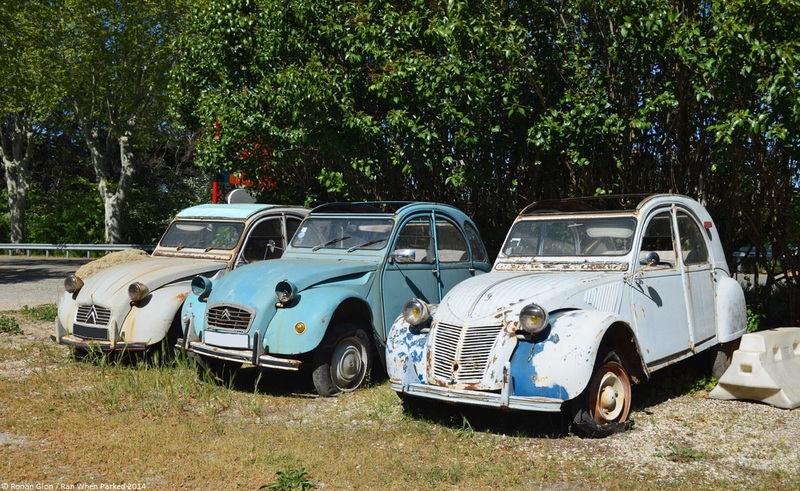 We’ve known about the three Citroën 2CVs pictured here for years but we didn’t take the time to stop and photograph them until a few months ago. They’re sitting on the side of a busy road in front of a restaurant along with a Dyane and several other newer cars like a Peugeot 205 and a Renault Safrane. The car on the left was built in either 1963, when a new instrument cluster appeared, or 1964, the last year of the metal grille with the large chevrons. It is fitted with several home-built components including a hard top made out of a piece of sheet metal nailed to a wooden frame and the best illustration of the term “beach seat” that we have ever seen. Built in the early 1970s, the middle car is the newest one of the bunch. It’s a relatively luxurious 2CV 6 model fitted with steel hubcaps, split front seats and a 602cc flat-twin engine. It was built between 1970, when the 2CV 4 and 6 models were introduced, and 1973, when the 6 got a single-spoke steering wheel. Careful observers will notice the original grille has been replaced by a plastic one that comes from a post-1974 model. The blue car’s registration number was issued in Paris in 1997 and it was last registered in 1999. The three 2CVs are in a highly-touristic area so it’s not too far-fetched to imagine the blue one was driven down from Paris (about eight hours at regular freeway speeds, probably a lot more in a 2CV) for a holiday and left locally after it broke down. The car on the right is an AZL model built in the late-1950s, making it the oldest one of the three. It has been sitting outside without a top for years and time has not been kind to it. It is the most far-gone one of the three as far as the body is concerned, but it is likely still worth restoring as early 2CVs are scarce and shooting up in value. We drove by these 2CVs a few days before writing this article and noticed that two of the cars are gone, hopefully sold to an enthusiast. We were driving by at a brisk pace and only managed to catch a quick glance of the place so we couldn’t tell which one is left.